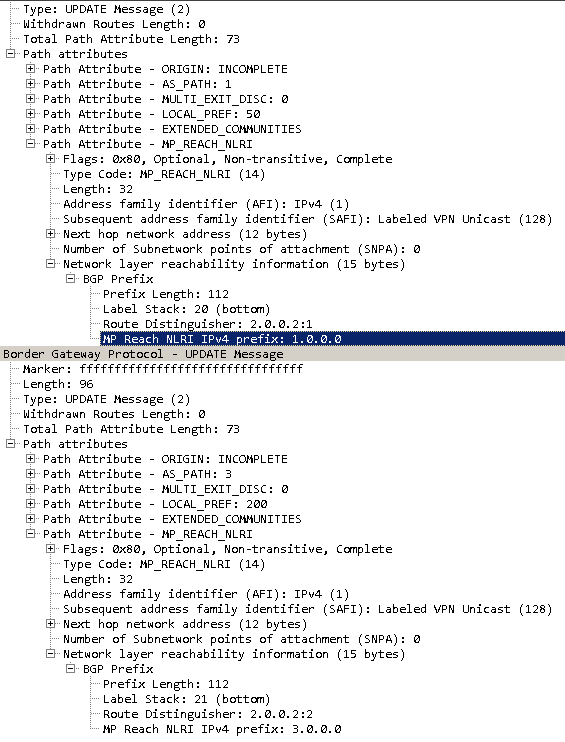 It is not listed in the limitations section for the BGP PIC documention for IOS or IOS-XE however, under the per-CE and per-VRF label allocation mode documentation for both IOS and IOS-XE, PIC Edge is only support with per-prefix labelling mode. 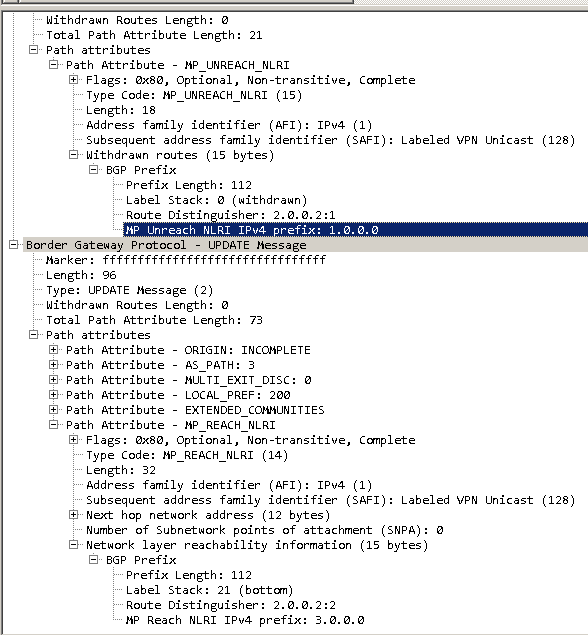 PIC Edge does not support Inter-AS MPLS Option B connections either (for all IOS/IOS-XE devices confirmed by TAC, probably IOS-XR too although unconfirmed). More details notes on the limitations with Cisco 7600s can be found here. The short version though is that for L3 VPNs, packet recirculation is required which might be OK for low traffic volumes as it halves the PPS rate of the devices, but even then, it creates a modest increase in memory usage which likely makes it unusable, even in low traffic scenarios. 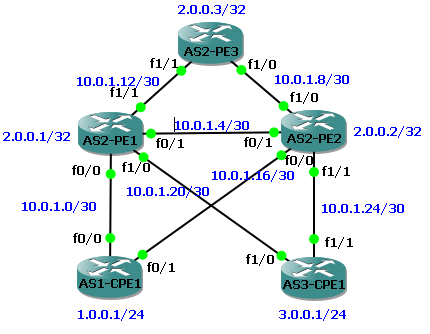 Below is an example PIC topology: AS1-CPE1 advertises 1.0.0.0/24 and the preferred path between AS1 and AS2 is via the AS2-PE1 link (Local Pref 200, MED 0, weight 0). AS3-CPE1 advertises 3.0.0.0/24 and the preferred path between AS3 and AS2 is the AS2-PE3 link (Local Pref 200, MED 0, weight 0). The AS1-CPE1 link to AS2-PE2 is the PIC backup path (Local Pref 50, MED 100, weight 0). The same is true for AS3-CPE1 via AS2-PE1. *>i 1.0.0.0/24       2.0.0.1                  0    200      0 1 ? *b x                 10.0.1.18                0     50      0 1 ? *bi 3.0.0.0/24       2.0.0.1                  0     50      0 3 ? *>                   10.0.1.26                0    200      0 3 ? *                    10.0.1.18                0     50      0 1 ? * i 3.0.0.0/24       2.0.0.1                  0     50      0 3 ?